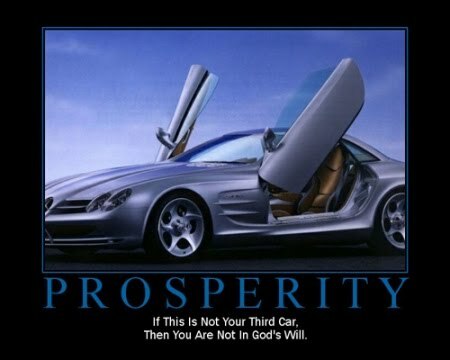 Nothing used to annoy me more than the preachers of the Prosperity Gospel. I felt like they were turning Christ’s message of faith into something you could find on an infomercial. It seemed like money and “blessings” were the only things on their minds and like any other pyramid system it was the people on the bottom who were “blessing” the people on top. I could barely listen to it. I wanted to scream at the top of my lungs “WAKE UP!!! CAN’T YOU SEE YOU’RE BEING PIMPED!” But instead, I kept my peace and only shared my opinion when someone brought it up to me directly. Usually it was some frustrated person who paid their tithes, but couldn’t pay their light bill who would be “waiting on the Lord for a miracle.” Here’s an exaggerated example of a conversation for some imagery. Broke Person: Pray for me brother, I need a miracle. Me: Of course, what’s the issue? BP: I can’t pay my light bill. BP: Well, earlier this month the Lord blessed me with a flat screen TV, a gold watch, and some new clothes. Then toward the middle of the month the blessings stopped flowing right when we were running out of food and our lights were about to be shut off. I prayed but I didn’t receive any sign that God was listening. The light bill was $125 but I only had $122. I wanted to pay them the whole thing instead of coming up short so I bought $20 in lotto tickets and a bag of Fritos. Then I put my last $100 in the plate at church believing that God would multiply it 10, 100, or maybe even 1000 fold. But so far nothing and the cutoff notice is for tomorrow. What should I do? Me: Well, how much was the TV, watch, and clothes? Me: Well, I’ll pray for you, but it seems to me that God already multiplied your $100 tenfold in advance ($100 x 10= $1,000). Have you considered the possibility that perhaps God blessed you with what you need and that you blessed yourself with those other things? BP: Do you think you’re better than me? I don’t want to hear your negativity. I am a child of God and a good person who goes to church and pays my tithes. I deserve all of my desires and no discomfort in life. Everything should go my way and it is nothing but the Devil that has put me in this situation and you are in league with the Devil. When I get blessed with all my material desires and am living in my mansion, I am not inviting you to any of my parties with important guests dressed in beautiful clothes who all love me. You can keep your prayers you Antichrist. Now of course this is an exaggeration, but the essence of it is true. I have known so many people who literally believe that God is their Santa Claus and that if they are good people all of their dreams should just come true. For a long while I held prosperity preachers responsible to some degree, but one day I realized that they wouldn’t have an audience if that wasn’t what people wanted to hear. I also prayed for God to show me some other good that was coming from this message and came to understand that for some people this message was actually helpful, because before this word was preached to them, they were on the opposite end of the spectrum, believing that they were worthless and did not deserve anything. For those people, hearing that they could have what they wanted was helping them to see that they had value in the world. My blessing was that God showed me compassion for them and for the preachers and I got over my complete aversion to this message. Still, there are those who have become addicted to this idea of looking for miracles in the form of external and material manifestations. The needs for these kinds of signs is like Spiritual training wheels. In Matthew 24:24 Jesus warns that false christs and prophets will try to deceive, even the elect, with signs and wonders. So while I celebrate as much as anyone when a Spiritual desire takes shape in a pleasing form, I think it is unwise to be attached to these forms and to see them as our “right” for being good and “spiritual” people. This mentality just weakens our emotional, mental, and ultimately our physical constitution and leaves us susceptible to the control of anyone or anything that offers us promises that all of our dreams can come true. When it says, “The Lord is my Shepherd, I shall not want,” Psalm 23 is giving a strong clue as to how we should approach desires in this world if we claim to know who God is. God provides all of our needs. Consider the lilies. The thing is that many of us do not know the difference between what we want and what we need. The video below might add a little perspective though. Now here’s the part that might sting. All of our dreams do come true, but sometimes our dreams are nightmares. By focusing on the material so much we are often distracted by our selfish desires and do not see the truth of the Spiritual being within us trying to be born into the world for the glory of all beings. I’ll let Paul try to explain it. For we know that the whole creation groans and labors with birth pangs together until now. Not only that, but we also who have the firstfruits of the Spirit, even we ourselves groan within ourselves, eagerly waiting for the adoption, the redemption of our body. For we were saved in this hope, but hope that is seen is not hope; for why does one still hope for what he sees? But if we hope for what we do not see, we eagerly wait for it with perseverance. Likewise the Spirit also helps in our weaknesses. For we do not know what we should pray for as we ought, but the Spirit Himself makes intercession for us with groanings which cannot be uttered. Now He who searches the hearts knows what the mind of the Spirit is, because He makes intercession for the saints according to the will of God. And we know that all things work together for good to those who love God, to those who are the called according to His purpose. For the purposes of brevity, I am going to focus on the passage that says, For we do not know what we should pray for as we ought, but the Spirit Himself makes intercession for us with groanings which cannot be uttered. First off, I consider it a fact that most of us have no idea what we should pray for. We are so programmed by our upbringing, marketing campaigns, and other forms of media that we actually don’t know what we truly desire or need. We know what we are “supposed” to want or need primarily based on our demographic, but in reality, in a world of infinite variety, it is very unlikely that hundreds of millions of unique individuals are attracted to the same things for similar reasons unless they are conforming to some external standard that is telling them what they want. But enough of the conspiracy theories, the point is that we don’t know what we should pray for so those of us who pray consciously are likely praying for things that we don’t really need. As I like to say, “If we really believe God provides all of our needs, then we can only want what we don’t need.” This is why materially based miracle mindedness will throw you off every time even if its only by a tenth of a degree. Over time that tenth will put you way off the mark. As far as the Spirit interceding for us with groanings that can’t be uttered, well, that is difficult to put into words for obvious reasons. It says it can’t be uttered right? The power of this statement can only be sensed when you are able to be comfortable with paradoxes. It is the sound of silence and the action taken in stillness. Still I will try to give you an example. Have you ever used a GPS and when it told you to go one way you went another way that you felt was better? If so, then you might know the feeling of getting so annoyed with the GPS continually saying “recalculating” that you turn it off. Well, within you there is a perfect GPS (God Positioning System) that tells you where you can feel the Power and Presence of God. But with this GPS, you know you are getting closer to your destination when you no longer feel the need to look for signs and messages that tell you that you are going the right way. Why is it that way? It is because God is always absolutely and fully Present right here and right now. If you are looking outside for God then you are going the wrong way. This can’t be uttered because people with materially based miracle mindedness don’t want to hear this. It makes their survival instincts kick in because they think you are trying to take something from them, when the irony is that it is just the opposite. But in order to “see” the fruit of this message, one must walk by faith and not by sight. I’ll leave you with these words attributed to Jesus as the final clue of how it works. We will pray for continuous blessings so that we wont be in temptations and we cant commit sins.And we should not too worry for tomorrow for God knows our needs, and He wont allow bad things to happen.